Praise for When Can You Trust the Experts? "For decades our nation's debates on education have obsessed over a small number of politicized hot buttons—charter schools, vouchers, class size, teachers' unions—while chasing expensive fads of dubious value. What's missing is evidence on what works and what doesn't. At last we have a place to go: Dan Willingham's indispensable guide to fact and fiction in educational methods. Read it and buy copies for your children's teachers, principals, and school board members." "Daniel Willingham tackles one of the most difficult—but least discussed—problems for educators: how to sort through the barrage of programs for sale and figure out what really works. Unlike other experts who try to persuade teachers to simply adopt their views, Willingham gives nonscientists the tools and knowledge they need to wade into the research and draw their own conclusions." 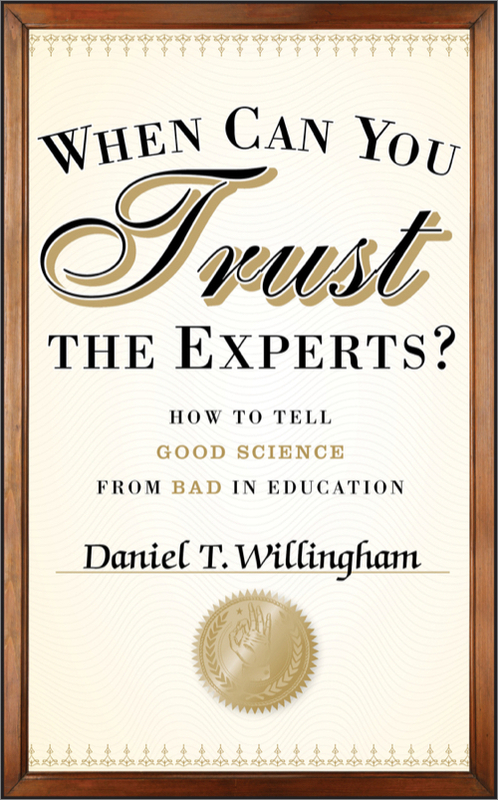 "If Dan Willingham had written this book fifty years ago, American education would have been spared innumerable snake-oil peddlers, unkeepable promises, deceptive claims, and false panaceas along the path to better schools and greater learning. But he's delivered a marvelous guide for future excursions along that twisting path." "A distinguished scientist gets down to brass tacks in explaining how to judge the scientific claims invariably offered to support educational programs. This lively, readable book should be in the hands of every teacher, administrator, and policymaker." "Willingham's When Can You Trust the Experts? provides teachers with an in-depth guide on how to parse the helpful from the abhorrent. With the plethora of education research today, teachers finally have a book that asks us to challenge the validity of current education products through a simplified scientific approach. Unlike other education research books, however, Willingham prefers to spark conversation and invite educators in."